I love appetizers. We frequently have appetizers for dinner. I make many different recipes on those nights, and usually serve with my favorite cheese platter and baguettes. This is a great appetizer that can be made in a small or large amount. I have taken these to many different potlucks, and they are always gone before I leave. You can bake the potatoes if you would rather, but I am usually in a hurry and I microwave them. Preheat oven to 400°F. Wash and dry potatoes. Use a knife and poke holes with a fork or small knife all over each potato so they don’t blow up. Microwave for 5 – 10 minutes. Check after 5 to see if they are cooked by pressing down on them to see if they give. Cut the potatoes in half and dig out a small portion of the inside, being careful not to get too close to the skins. You want them to stay intact. Place on a baking sheet and drizzle with olive oil and salt & pepper. Bake for 10 minutes. 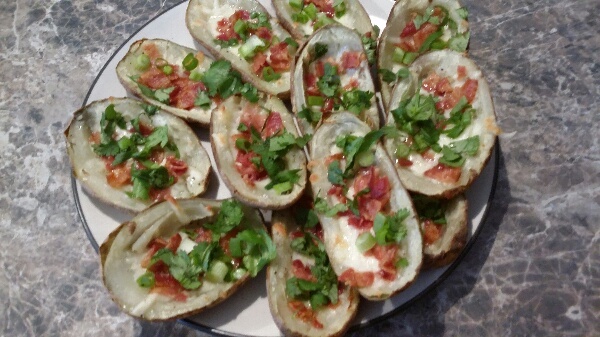 Fill each potato skin with a little cheese and bacon. Bake until cheese melts, about 3 – 5 minutes. Once finished, put on a serving dish and sprinkle with chopped green onions.